What Muscles Are Best to Work Out on Same Day? Determining which muscles to train together largely depends on your exercise experience, goals and how many days per week you devote to strength training. Several schools of thought exist on how to train your muscles and which ones pair together well, but the most important steps you must take are to rest muscles between workouts and listen to your body to avoid overtraining. Before you embark on a new training plan, it is best to determine what your goals are and how often you are able to train. For beginners and those only weight training two to three times per week, a full-body routine is the best option so that all muscle groups get trained at least twice over the week. Those who can strength-train four to five days per week usually have a more advanced exercise background and are looking to gain muscle or tone. They would be better suited with a split routine, such as alternating upper- and lower-body days, or even more isolated muscle days, such as chest and biceps one day, legs and core on another. All fitness levels can benefit from a full-body routine. If you are only strength training two to three days per week, a full-body routine is perfect because it works each muscle group in small amounts, so you don't risk overtraining and being sore for your next workout. Start by working your larger muscle groups first, such as your legs, chest and back. For example, you could do a deadlift with a bent-over row to work several muscle groups at once. Perform one to two exercises per muscle group. Follow that with smaller muscle groups, such as triceps, biceps, shoulders and core. 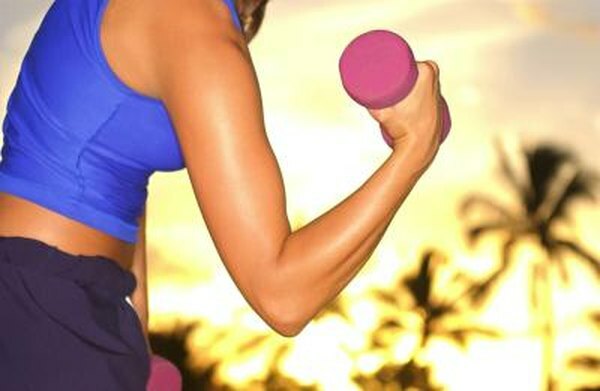 The more muscle groups you involve, the harder your body will work in a shorter amount of time. Aim to have two muscle groups working together simultaneously. More examples include lunges with bicep curls, chest presses with leg lifts, and squats with shoulder presses. Another way to split your routine is by doing all upper body one day followed by lower body the next. Your upper body includes chest, back, biceps, triceps, forearms, shoulders and abs. Your lower body consists of quadriceps, hamstrings, glutes, lower back and calves. To allow ample rest time, perform upper body Monday, for example, then lower body Tuesday, rest Wednesday, then repeat starting Thursday so each muscle group gets two workouts per week. If you are a beginner, stick to only one workout per muscle group per week to avoid overtraining. As your strength and endurance improve, begin to add one or two more days. If you are more advanced and have several days you're devoting to strength training, it is best to isolate your muscles into even smaller groups. For example, if you are working out five days per week, begin day one with chest and biceps. Day two could be back and triceps, day three legs and core, day four shoulders, and day five could be another leg and core day, or a second day for a muscle group that you are targeting more aggressively for growth. Some programs like to include similar working muscle groups, such as chest and triceps, rather than biceps, because chest exercises work the triceps as well. However, to fully maximize your muscle activity, you should work opposite muscle groups so each muscle is at 100 percent capacity in the midst of training. Rest time between workouts is extremely important to get the results you want. Muscle growth doesn't occur during the actual workout, but when your muscles are recovering and repairing themselves during your rest time. If you work the same muscle group before it has recovered properly, you can actually inhibit its growth. Though many factors influence rest time, the American Council on Exercise recommends allowing a muscle group to rest two days before working it again. Buildingmuscleworldwide.com: Which muscles should you train together?